Look at that face! You know he is a straight talker and you can count on him. Samson is a 1-year-old male cat who was brought to Lollypop Farm because his owner was moving and could not take him along. 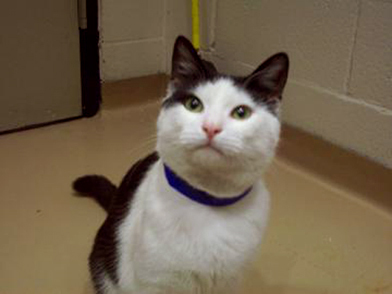 Samson has lived with other cats and with children before, and he got along with everyone. He's a playful kitty! Samson is currently living in one our catteries (multiple-cat housing areas) and doing well there. He likes people, but he enjoys his time alone too. Samson would love to meet you!